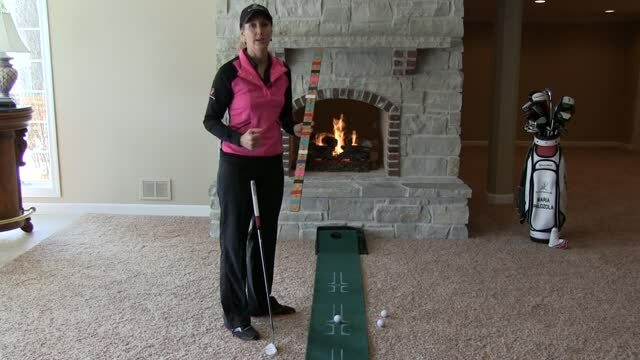 Description: The Putting Yardstick Drill helps you work both on the length of your stroke as well as your path. Start by getting a yardstick and putting a piece of colored tape 2 inches on either side of the center point. Next take a different color and go another 2 inches out and so on until you reach the end of the yardstick. For this drill you can hover your putter over the yardstick or just place the yardstick on the ground outside the toe of your putter and running parallel to your target. Start by trying to get a feel for swinging back and forth from the same color with an even paced stroke. I like to use a metronome (I downloaded an app on my phone) at the same time so I will stay within the same tempo whether it is a short stroke or a long stroke. Once you get a feel for a short stroke, gradually get longer and longer putting to the same color on each side of the stroke. Whether you are hovering above the yardstick or right next to it you can also look to see that your putter is swinging back and through on a straight line if you like to put on a straight path or on a slight arc away from the yardstick if you like to putt on an arc. An added bonus of this drill is that you can actually hit putts as well. You can either place the ball on the floor if you are practicing alongside the yardstick or you can place the ball on the yardstick and putt right off of it. Working on grooving an even stroke and with a consistent tempo inside will translate to better distance control out on the greens.